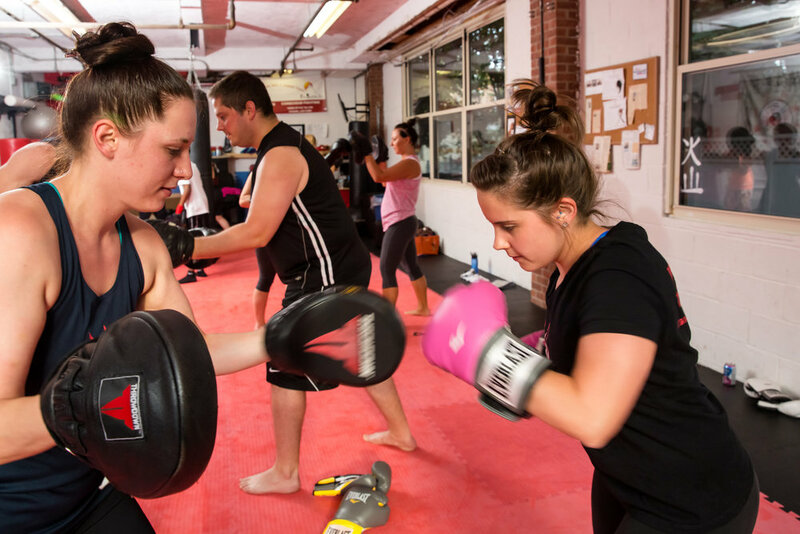 Anubis Fitness is the premier Fitness Kickboxing studio of Nyack. Focusing on high-energy Kickboxing workouts, as well as Interval training, Circuit training, Body-weight training, Tabata training, and Obstacle Course Race training. We offer small class sizes with a more personal experience, a studio where familiar faces become friends, family, and motivators. We provide a high intensity workout combined with an inspirational atmosphere to help achieve all your health and fitness goals. If you are ready to go to the next step and transform into the better you, then ask yourself this question in bold! This statement grounds members to remind herself or himself what values are important in their daily, hectic lives. Commitment is the basis of change. Anubis Fitness the home of Fitness Kickboxing will help and guide all members to grow, evolve, and transform into their best self. If you are ready, we are ready! Try The 3 Class Introduction for $20! Or The August Wacky Special! This introduction includes 3 full 1 hour classes with a mini-demo lesson before class. After your first class we will sit down to discuss your goals! There is no better way to shed pounds and build muscle in every single part of your body. Not sure about how you're going to get the physique you've always desired? See more. Do you want to see the results you can get when you make a commitment to your health? If you answered yes, then this challenge is for you! As an added program we have challenges that we hold every couple of months that push your fitness to another level. Weather it is a 4 week challenge or a 6 week challenge each will get you to eat right, and push your fitness to the next level. Kickboxing class and extra workouts will work the whole mind, body, and soul. See more. Ready for adventure? Are you training for Spartan Races, Tough Mudders, Mudderellas, Warrior Dashes, or any other obstacle race on your own? Want to train with a team? Join us! Our Spartan team this year has a collective goal of training for up to 4 Spartan Trifectas which comes out to 12 races. We train for obstacles through understanding technique and practicing in the studio so when we encounter obstacles on race day we are both mentally and physically prepared. We prepare for the challenges of the trail running by running and hiking in groups and understanding when to support each other when to push one another. Interested in becoming part of the team or just training? See more. 4 Week Summer Fitness Challenge? These testimonials show how commitment pays off! See all of our testimonials here! Follow @FitnessKickboxingNyack on Instagram to see what we are up to daily!